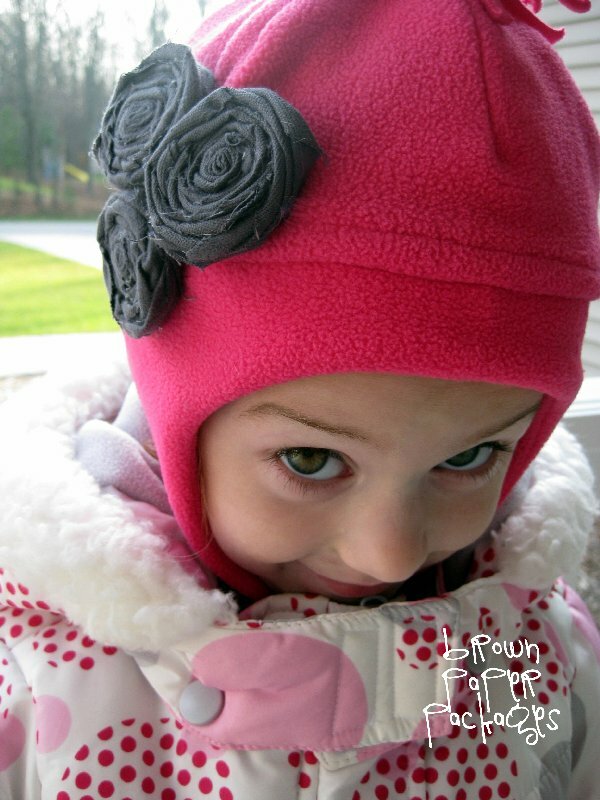 It’s getting chilly here, which means it’s time for hat & mittens! 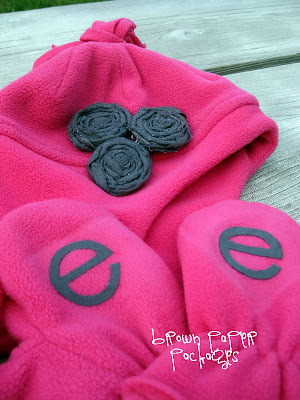 This is a super simple way to give new or old winter wear a little makeover…drab to fab! The cost? I spent $1 on fabric, and used less than 1/4 yard, so 25 cents! Add in a glue stick, and about 4 inches of heat ‘n bond, and we’re talking a grand total of about 75 cents. Love it. 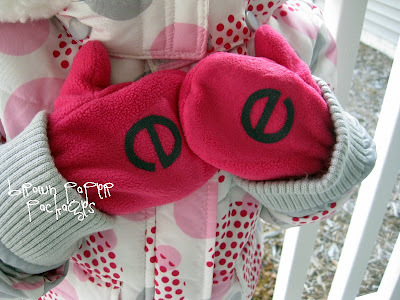 And trying to figure out which mittens go to what girl? Problem solved. Hat: I made six rolled fabric flowers (click HERE for the tutorial)–three for each hat. I made two of them a little larger, with one smaller. The only thing I did differently was the way I folded the material in the beginning. Instead of taking my strip of fabric and rolling it up into a tube, I folded in in half, then ironed it flat. I did this because I wanted the frayed edges of the material to show on the flowers. Ironing it down makes a huge difference! Mittens: I followed the directions on the heat ‘n bond package to apply the “k” and “e” to each mitten. So easy, and SO darling! P.S. My friend Lei, over at My Many Colored Days is having a super fun giveaway. Go check it out! I'm so featuring these, thanks for sharing!! Absolutely adorable … I love the monogrammed mittens! May have to copy that idea. 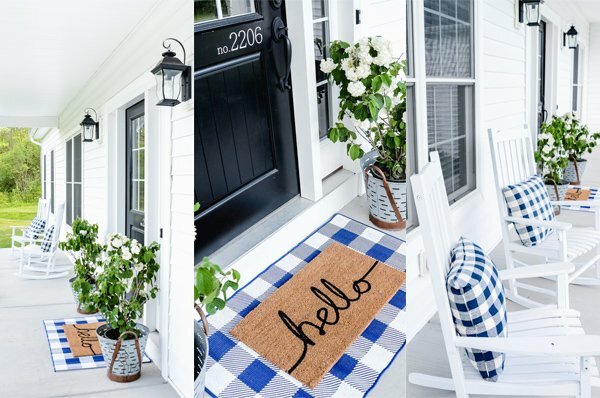 These are adorable, just wish I had some kiddies to make some for! Do you think it would be silly to wear them myself?!! I think the hat would work for kids or adults! Hi! I just wanted to let you know that I nominated you for a blog award on my blog! Take a look if you want to participate! FYI i found your blog from Ucreate and I'm featuring this adorable drab to fab mittens and hat on my Tutorials Tuesday post tomorrow :)! too cute for words!! So cute! Off to do that for my girls' mittens. OMG-love!!! Where did you get the hat? I want to recreate! We're going to link to this on our FB page. Flannery–The hats are from Old Navy–I bought the last year. This is such a smart idea. 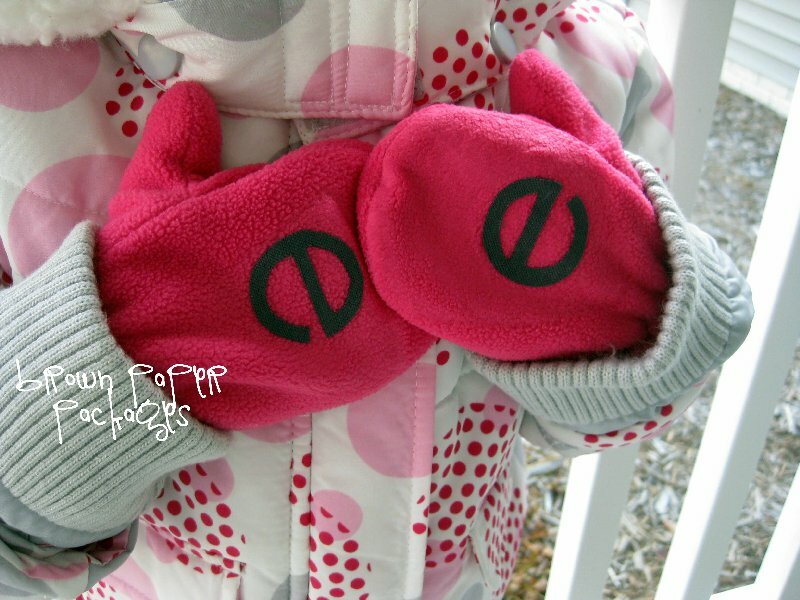 It's a great way to make sure you get the right gloves back from school.